The theme this week for ‘My Place & Yours‘ is bedside. What fun! I use vintage aprons to hide the storage shelves next to my bed as they hold things like sheets and towels; not too interesting visually, at times. Vintage aprons are much better to look at. 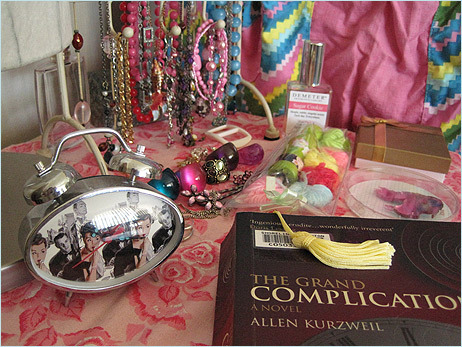 Currently I am reading “The Grand Complication” by Allen Kurzweil. Quite exciting, it is. I have a list of things I want to research after reading this book. Things like secret enclosures and palanquins. The retro-style clock is from my parents, I love the style of it. 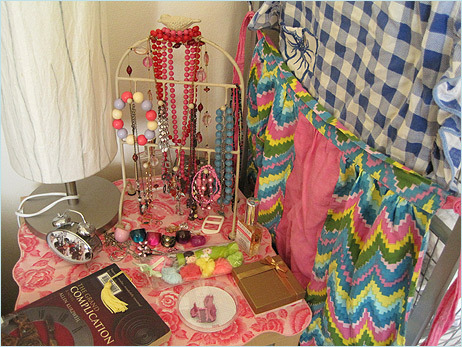 You can also see some of my retro-ish jewelry collection (inc. pink squirrel brooch), my ring collection (minus one or two), a dear little french knitting doll and my current favourite scent: ‘Sugar Cookie’ by Demeter. Thanks, Pip! It is lovely to gaze at colourful and cute things as you nodd off to sleep.